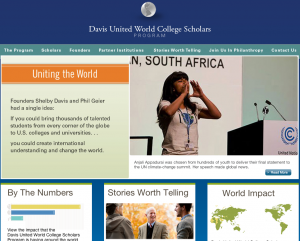 I’m pleased to announce the launch of a new website for the Davis United World College Scholars program. The site was designed by Mark Zelis in College Communications and much of the content on the site was updated for the new design by Regan Eberhart in College Communications and Maggie Paine in College Advancement. In addition to the new design, the site features a host of new stories about the program. This entry was posted in LIS Staff Interest, Middlebury Community Interest on May 8, 2012 by Ian McBride.